Could Israel and Palestine together become a peaceful "World Heritage Site"? Two communities, one largely Jewish/Zionist and the other largely Muslim/ Palestinian, have been at war with each other in The Holy Land for many years. Both groups have conflicting claims of ownership to much of the same land. Extremists on both sides assert that their claims go back beyond recorded history, to archeological times, and were even God-given. Today these communities seem incapable of coexisting peacefully. The former hold the latter under strict military occupation, which is often being met with violent resistance. (1) No end to the Israeli occupation or to the Palestinian intifada is in sight. (b) that the Antarctic Treaty can provide a useful precedent for the establishment of a nation-state-free zone, comprising most or all of present-day Israel and Palestine. The resulting region, tentatively to be called The Holy Land Protectorate (HLP), would guarantee equal human rights to all residents of the region, but grant specific statehood to none. HLP residents would instead enjoy special status as World citizens, carry U.N. Passports, and have full freedom of movement within and outside the HLP.Why should the countries of the world collectively impose something like the status of Antarctica on the region? Because The Holy Land is an archaeological zone of great value and a pilgrimage site of immense significance to three world religions. It is arguably the premiere World Heritage site. Culturally it is far too valuable a region to be claimed by one or two states to the exclusion of all others. Historically it has never been able to govern itself peacefully. Its long-term security is everyone's business, not just that of the present-day Israelis and Palestinians. International stewardship of the Holy Land is an idea whose time has come. It could finally bring justice, peace, and stability to the region. The human community is acutely aware of the sufferings of the Jewish people, and is determined not to let persecution of the Jews occur again. It is likewise well aware of the unjust expropriation of lands formerly belonging to Palestinian residents, of their general oppression and marginalization in the region, and of the terrible violence committed by each side against the other in the name of their deeply felt, but in the long term irreconcilable, national aspirations. Given these realities, the human community reserves the right to question and challenge the continuing existence of "Israel" and "Palestine" as concepts and as political entities. The goal of this proposal is to move the inhabitants of The Holy Land to a new level, that of World Citizens. Let them be the first to transcend statehood. Let the leading powers of the world bring about a just peace in the region, first by giving it a privileged, protected, and demilitarized status; then by a process of arbitration of property claims in the context of inexpensive, long-term land leases rather than expensive land ownership. 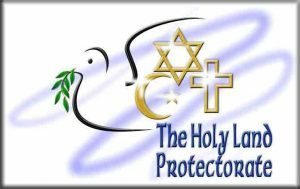 Let the Holy Land thus become a place of peaceful co-existence for Jews, Christians, and Muslims alike: a beacon on a hill, a light to the nations, and a destination of choice for pilgrims, scholars, and tourists from around the world. Key to the success of this proposal will be creating a global consensus that the extra-national status of the entire region, imposed by the community of nations, based on the brilliant precedent of Antarctica, is the best option for securing justice and peace in The Holy Land. It will not be easy. It will require moral imagination, non-violent leadership, solidarity, courage, and collective will. Managed successfully, an international consensus such as this could lead to the peaceful disestablishment of Israel and Palestine as actual or potential nation-states. Such a transformation, if undertaken with generous financial incentives and open hearts, could be both orderly and fair. Regional resistance, if any, could be met with firm, patient, and non-violent international boycotts on the one hand, generous economic incentives on the other. Supported with the careful reorganization of important "national" assets in the region (such as El Al, which might become Holy Land International Airlines), and phased demilitarization, a true internationalization of the HLP under U.N. Administration should be possible in a relatively short time. Note (1). The extent of depopulation, fragmentation, and control imposed on Palestinians by the Israelis is perhaps best visualized in a series of maps. See www.passia.org for a Palestinian view of this unfortunate history, and www.icahd.org/eng/ for the Israeli Committee Against House Demolitions' view of the situation, equally damning. The "Matrix of Control" map at the latter site is a sobering reminder of the divide-and-conquer intentions and actions of most post-1967 Israeli governments. Note (2). As quoted in Marc Ellis, Ending Auschwitz: The Future of Jewish and Christian Life (Louisville: Westminster/John Knox Press, 1994), p. 47. Note (3). The United Nations General Assembly's Resolution #181 (II) of 29 November 1947, creating the partition of Palestine, stated in "Part III – City of Jerusalem": A. The City of Jerusalem shall be established as a corpus separatum -under a special international regime and shall be administered by the United Nations. The Trusteeship Council shall be designated to discharge the responsibilities of the Administering Authority on behalf of the United Nations. More is the pity that Resolution #181 (II) was not implemented in 1947. Like so many U.N. resolutions on the "Question of Palestine," it has failed to inspire the community of nations to action. The injustices and violence that have ensued, engulfing the entire region, make the internationalization of Jerusalem alone, at this point, an impossible dream. More than ever, Jerusalem's fate seems inseparable from that of its surrounding lands and villages.